Dorval Trading Co., Ltd. announces its latest SOUR POWER® item – 4oz Peg Bags! “The popularity of the SOUR POWER QUATTRO® concept has been extremely successful in the market during the 30 years of SOUR POWER®. It seemed only fitting to create an item featuring top selling flavors and colors all in one bag”, says Roberta Cappel, President. Each bag has its own unique theme, but is consistent with the bright and vivid colors consumers have come to know and expect in SOUR POWER®. They are packed in 12ct cartons, easy to be added to any peg section. The new 4oz Peg Bags are available now. 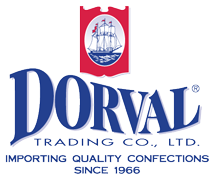 Dorval was instrumental in launching the sour craze in the United States in 1985 with SOUR POWER®, and is currently celebrating its 30th brand anniversary. SOUR POWER® is now available in Straws and Belts in wrapped, unwrapped or bulk format in a variety of package types and flavors.